In an earlier post, see Hitchhiker’s Guide to Get-EsxTop – Part 1, I described my first experiences with the new Get-EsxTop cmdlet. While the use of the cmdlet is rather straightforward, the data it returns is not so easy to interprete. Luckily Carter intercepted a secret cable that allows us to actually use the data returned by the cmdlet. The following is my first attempt to write a wrapper around the Get-EsxTop cmdlet. The idea is to have a script that produces statistical data similar to what resxtop produces. The PowerCLI Dev Team gave us an early XMas present yesterday. They released PowerCLI 4.1.1 build 332441 or PowerCLI 4.1 Update 1 as it is called in the Release Notes. As usual there is a nice collection of new cmdlets and improvements on existing cmdlets in this new PowerCLI 4.1.1 build. Two of the new cmdlets that jump out for me are the Get-EsxCli and the Get-EsxTop cmdlets. Although both cmdlets are still marked as ‘experimental’, they both open up a complete new area for automation. 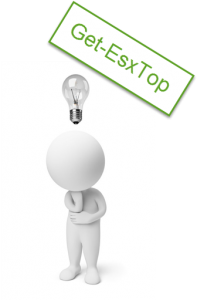 In this post I’ll have a closer look at the Get-EsxTop cmdlet and what you can do with it.